We have re-designed this pipe for better fitment and to reduce vibrations, but there may still be a slight increase in vibration on some PDK-equipped cars (only) when idling at stops in Drive mode. We recommend using the Sport or Sport Plus modes if this is a concern, which allow the engine run smoother and at a slightly higher RPM. Note: Can also be used on S / C4S models with the 3.8 engine, please read below **. Not recommend for systems that already have the PSE "Sport" exhaust. Following on from our well-received Shark Werks 997 GT3, Turbo and Carrera exhaust designs we have now applied our customary Shark-bite to the Porsche 991 Carrera 3.4L non-S model. In stock form the car has been accused of sounding high-pitched, tinny and too mechanical in comparison to S models, especially with their deeper sounding PSE options. 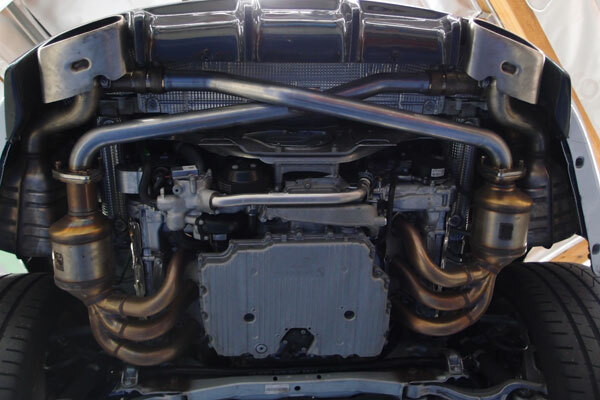 3-D CAD designed with optimal flow, fit, weight savings and sound enhancement, our system replaces the center muffler on any Porsche 3.4L and 3.8L 991 Carrera. By utilizing appropriately-sized diameter tubing and straightening out the flow, we achieved our desired sound and minimized resonance. Our direct bolt-on exhaust installs into the factory location without any modification or compromise and is completely reversible. An overall weight saving of 7 pounds is achieved with a more aggressive idle and outside bark with a deeper tone. On the inside you can still talk on the phone and/or listen to the radio without any compromise. When you apply aggressive throttle you can hear a more exciting pitch and tone. Playing around with the throttle induces crackles and deeper howls more fitting for a 911. 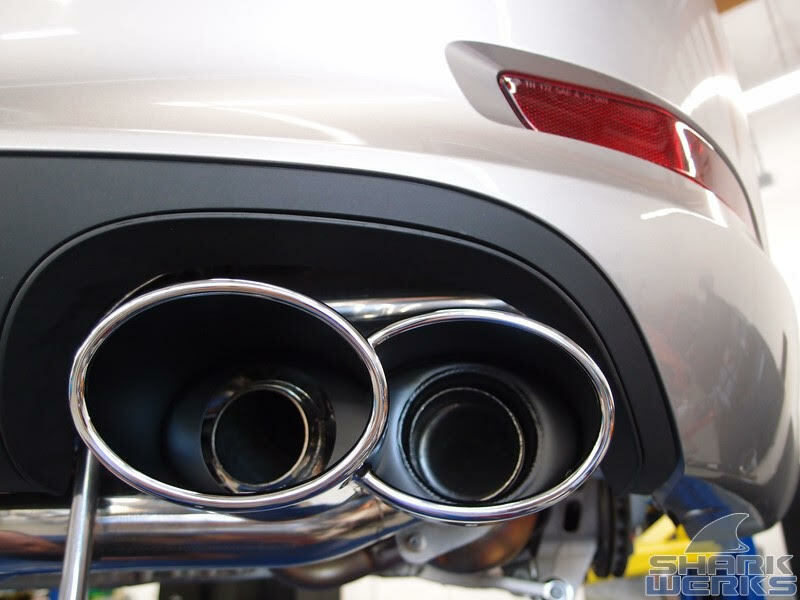 The stock center muffler does not utilize a straight-through design and instead collects and merges in the center (hence you can often see a hot spot in the center) causing the sound to be more muted than some would like. Expect slightly better performance due to optimized exhaust gas flow. Installation can be performed in about an hour without any rear bumper removal. 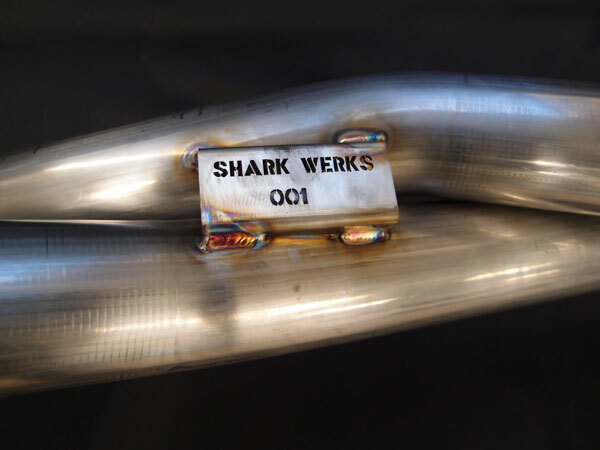 As with all previous Shark Werks exhausts, this system is 50-state emissions compliant but also does not cause any check engine lights (MIL Codes) as it is designed to continue to operate with the factory catalyst and emissions equipment. 7 pound weight savings from the rear of the car. 18 gauge T304 tungsten inert gas welded stainless steel mandrel-bent C.N.C construction for durability and flow. 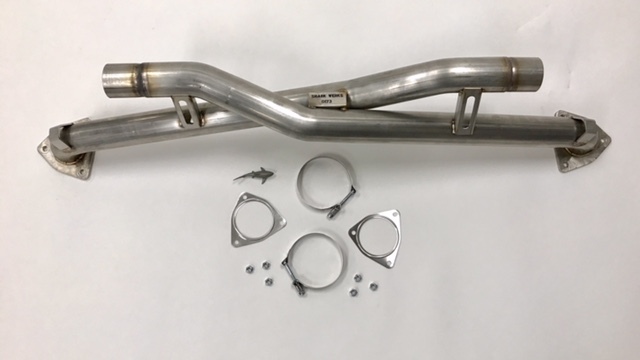 ** Note: If your Carrera S / C4S 3.8L did not come with the Porsche Sport Exhaust (PSE) and you are looking for a little more volume / exotic tone and burbles, this pipe will accomplish your goal. It will however change the exhaust so only one side of the current "dual tip" is functional; thus looking at the car from low to the ground / behind the car, you will see that only one side of the tip is functional. 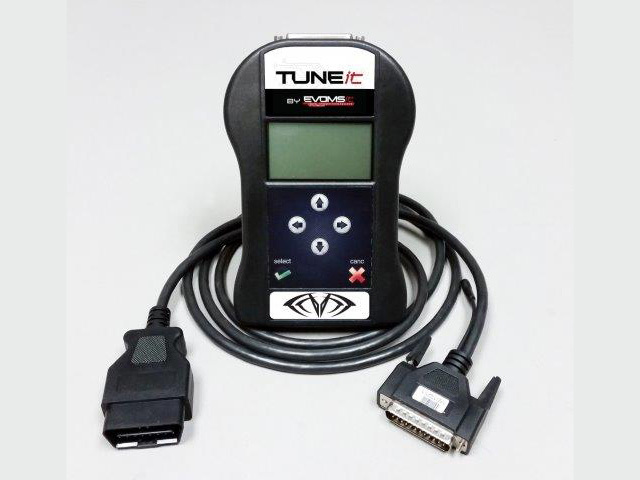 This has no negative impact on sound or performance.